Does Odyssey Hit the Fan? 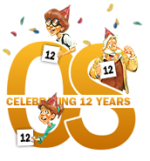 The Odyssey Scoop: Celebrating 12 Years! AIO to Debut on DVD… Again?